President Trump said the USMCA, the NAFTA replacement, will "ensure that more cars are proudly stamped with our four beautiful words, 'Made in the USA.'" WASHINGTON -- President Donald Trump told the nation Tuesday night that his trade policies are helping restore American auto and other manufacturing jobs and asked Congress to give him even more unilateral authority to impose trade remedies on other nations. 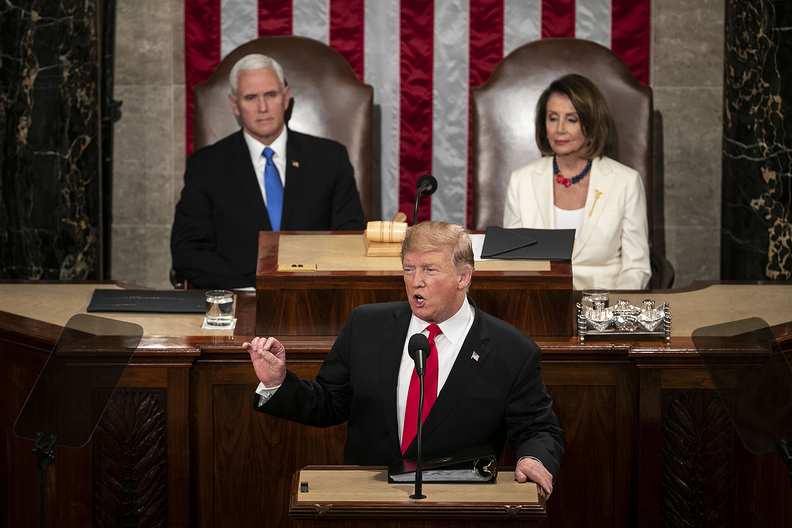 In his State of the Union address, Trump said the renegotiation of the North American Free Trade Agreement rectifies a "historic blunder" that led to the migration of good-paying jobs to Mexico and urged lawmakers to approve the U.S.-Mexico-Canada replacement. The USMCA will "deliver for American workers like they haven't had delivered to for a long time," Trump said from the floor of the U.S. House of Representatives. "I hope you can pass USMCA into law, so we can bring back our manufacturing jobs in even greater numbers, expand American agriculture, protect intellectual property and ensure that more cars are proudly stamped with our four beautiful words, 'Made in the USA.' "
Experts cautioned that the new agreement essentially keeps the structure of the existing NAFTA in place -- and that the new agreement still requires ratification by Congress. Key lawmakers in Trump’s own party said they would not move to vote on the agreement until the White House removes the steel and aluminum tariffs it imposed on its northern and southern neighbors last year. Those duties have sparked in-kind retaliation from Mexico and Canada that’s targeted U.S. agricultural goods. Democrats in both the Senate and the House of Representatives have said the deal doesn’t go far enough on labor and enforcement and have demanded reopening the negotiations before they could give the deal their blessing. U.S. Trade Representative Robert Lighthizer said reopening the deal was not an option, further jeopardizing Democratic support. The new agreement also didn't prevent General Motors' plans, announced in November, to cut about 15,000 jobs in the United States and Canada. GM's restructuring calls for as many as five North American plants to shut down this year, pending negotiations with the UAW. "Wages for autoworkers have had a 25 percent pay cut in recent decades. This must change," UAW President Gary Jones said in a statement after the speech. "Let us restore the American worker as a priority in the laws, trade agreements and the underlying values we cherish. Our challenge is to restore the American Dream. Because American workers have invested in America and now they look to Washington to invest in U.S.!" Philip Levy, senior fellow at the Chicago Council on Global Affairs and a trade official in Republican President George W. Bush's White House, told the Associated Press: "President Trump has seriously overhyped this agreement." Tariffs on $250 billion worth of Chinese goods, and on imported steel and aluminum, are hurting some American businesses, but Trump said the duties have brought China to the negotiating table, where the U.S. is insisting on an end to unfair trade practices and more balanced trade to protect U.S. workers. Trump urged Congress to pass the Reciprocal Trade Act, introduced by Rep. Sean Duffy, R-Wis., which would give the president broad new power to raise tariffs to match the level of high tariffs on U.S. products in other countries. Senate Finance Committee Chairman Charles Grassley, R-Iowa, has already dismissed the idea, which is expected to gain little support. Grassley and other Republicans support legislation introduced last week that would rein in Trump's power to impose tariffs for national security reasons, as he did with steel and is threatening to do with light vehicles. Editor's note: An earlier version of this story misstated the date of President Trump's State of the Union speech.